Mount Bachelor ski resort announced this week it will break ground on a new lift on the south-east side of the resort this summer. The high-speed detachable quad was approved in 2013 as part of the resort’s Master Development Plan, according to Mount Bachelor’s interim general manager Jim McLeod. The new chair, which is slated to open in December 2016, will add 635 acres to the mountain’s skiable terrain making Mount Bachelor the fifth largest ski area in the United States with a total of 4,318 skiable acres. 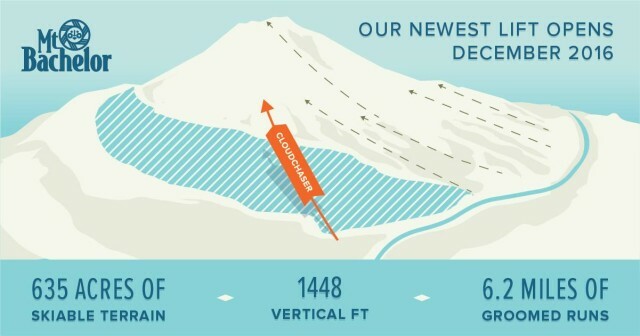 It will access 1,448 vertical feet of terrain, some of which was previously open to skiers but required a long hike along the low east catchline to return to lift-accessed riding. The chair will be called Cloudchaser, to the dismay of some Facebook commenters who hoped for the opportunity to vote for a catchier title such as Liftie McLiftface. The name reflects a common weather pattern where clouds approaching the mountain from the west tend to dissipate as they cross the summit to Bachelor’s east side. The location of the lift will provide more protection from the elements during winter storm cycles. "Projects of this magnitude don't happen overnight, but from the time we first scouted the east side terrain for the possibility of a new lift we knew Cloudchaser would be a special addition to the Mount Bachelor experience," Director of Mountain Ops Tom Lomax told KTVZ.com. Cloudchaser is the first completely new chairlift providing access to previously unserved terrain at Mount Bachelor since the installation of Northwest Express in 1996. It’s the largest capital investment project to date under the ownership of Powdr Corp. Other projects have included replacing the Pine Marten chair, renovating the West Village Lodge, and the installation of a downhill mountain bike park. Mount Bachelor will host a Cloudchaser Celebration on May 7 with free lift tickets and live music. Lifts will run from 8 a.m. to 2 p.m.